Place mouthpiece in mouth. If it is too long cut the back edges with scissors so it is the right length. Boil water. Place mouthpiece in water holding the end that attaches to helmet for 20 seconds or until mouthpiece goes limp. Once limp, dip in cold water for one second. Place in child’s mouth positioned tightly against upper teeth. Have child to bite down for 10 seconds, sucking to pull the mouthpiece tightly against upper teeth. Dip mouthpiece in cold water for 10 seconds. If child bites a hole in it, then it was too soft. 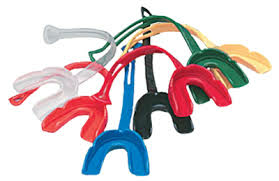 Ask your coach for another mouthpiece and repeat. Wash mouthpieces once per week with soap and water. Wash practice pants only once per week (during weekend). This saves you and us money(replacement of pants). Check wear and tear of pants once per week. Disinfect shoulder pads once per week with something similar to Lysol. Check wear and tear of shoulder pad strings once per week. Disinfect helmets once per week with something similar to Lysol. Shine your helmets with pledge or similar agent before every game. Check helmet screws to ensure they are all tight once per week. DO NOT run knee pads, thigh pads, hip pads or tail pads through the dryer, especially thigh pads! If you have an equipment problem, please see your team equipment manager or your coach. Your child’s age on July 31st is his or her age for the season. Some divisions allow an “older but lighter” player to qualify as shown. The last year of eligibility falls under more stringent weight restrictions. A player may gain one pound per week after the second game, up to a maximum of 9 pounds. Click to download and print the National Age-Weight Matrix.The zip code where you reside coincides with the league and team you will play or cheer with. If you wish to play for a league outside of your designated zip code a “Waiver Form” will be needed. You can find this form on our forms and resources page. Please be aware that this form must be signed by both leagues affected. If you reside in a zip code that is designated to multiple locations it is up to the player where he or she wants to play.